...He was tied for 333rd in the NFL tackles during the 2011 season with 36. He was tied for 90th in the NFL in sacks with four. Suh did not force a fumble nor recover a fumble, although he did block an important field goal attempt at Oakland. He did not have a productive season in correlation to his reputation as a dominating defensive lineman. It was less than half the production of his rookie year. And that is not factoring in he got suspended for two games for stomping on an opposing player's arm, and that the penalty itself, hurt the Lions mightily during their Thanksgiving Day game vs. Green Bay. Yet, Suh is on a network halftime show during the playoffs. He appeared with Jimmy Fallon. He is on the cover of the NFL's new magazine. He is the subject of much-hyped ESPN interview with Hannah Storm tonight. In the trailer for the ESPN interview, Suh explains how he wanted to prove that he could do the same things in the NFL he did in college. And he did - his rookie year. He didn't last season, and it's odd how there seems to be this national perception he did. Suh raised a lot of eyebrows when he didn't show up for any of the lockout workouts with his teammates until the very last one when the NFL Network was there to do a feature on him. The local media got its collective nose out of joint that day because he didn't talk to them. I defended Suh on the issue. He doesn't have to talk to anybody. Yet, if it benefits him, it's all he does is talk - in hand-selected situations which are self-enhancing. And honestly, it isn't that enlightening. When he spoke after the Thanksgiving Day incident, he was downright disingenuous. I guess this is an attempt to reshape his image after what transpired this past season, but the biggest factor isn't a publicity tour like he is promoting a new book. It's about production on the field. Wouldn't that do more than anything else to restore Suh's image? Suh is certainly capable of repeating or even surpassing his rookie season. And if he does, not only will a media tour be in order, so might a Super Bowl parade in Detroit. But right now, honestly, it does seem inappropriate. What is with your constant berating of N. Suh? Why do you keep harping on this man? Even McCosky who always finds fault with players doesn't beat up on Suh the way you do. Let it go. Talk about the current Pistons travails or the WIngs playoff chances, how about other possible moves by the Tigers for this season but enough about N. Suh. Please. Great praise comes with consistency and occasional bursts of greatest. This media attention will only last so long, unless there is consistently good or really good play. The big leagues have a way to negate. But you can't diminish the not-stat importance of getting doubled every play. Good blog Pat, your assessment is dead on and it needs to be said. I'm beginning to wonder if Suh is running for political office. Suh says he wants to 'put it behind him and look forward', yet he continues to talk about it. We moved on weeks ago. It's a shame, all the good stuff he could be talking about that happened with his team this season, but it's still all about "Suh". Guess he wasn't listening when Raiola told the team to 'grow-up'. I'm tired of the "Suh" myth and the hype. You're right, his numbers/performance did not support his reputation as a dominanting defensive lineman and that was apparent BEFORE his suspension. The 'double-team' argument is cliche and invalid. Suh is a good athlete and I'm glad he is on our team. Hopefully this is just a sophomore slump as a result of his frustration in finding that the average NFL offensive lineman does not fear him and the offensive line talent in the NFL is a little bit higher then at the college level. Suh is finding that he will have to work to be 'the star', and that's a new one for him. He's also not accustomed to receiving anything but praise for his actions, so this has been a tough year for him in that regards also. 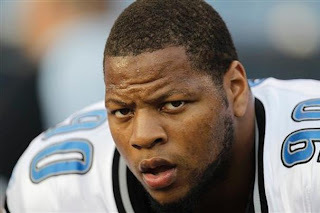 Lastly, Suh is quickly becoming just another example of what is becoming today's professional athlete. I don't think there's anything wrong with asking your professional athletes to be "professional". It insults me as a fan that today's athletes expect you to support their immature, inappropriate and/or narcissistic behavior or not be considered a "true fan". This storyline with Suh is long from over. I hope it turns out for the benefit of the Detroit Lions, but somehow I think it's going to go the way of such stars as Allen Iverson, Terrell Owens and such. Put em on a pedestal, knock em down ... put em on a pedestal, knock em down ... doesn't it get boring writing every single story the exact same way? Agree, he had a very disappointing year, but not a disastrous year…4 sacks despite him missing almost 3 games. Now were comparing him to Iverson?? Please, just don’t see it at this point. He’s no Boy Scout, never has been and never will be, and to be frank, I don’t want him to be, because that’s not who he is. He might not ever get 10 sacks in a year again, but keep in mind, that’s almost videogame like for a DT to do that. Yes, he needs to grow up, become a better leader, but it’s insane to throw him completely under the bus. Despite his shiny new role on TV, Warren Sapp was a known borderline dirty player when he played; self admittedly used to spit chewing tobacco on guys during games, totally wrecked that OL from Green Bay on that INT return when he was 30 yards removed from the play. Just a guy who played with an edge…much like Suh. He definitely needs more focus, and work on being a better leader, but let’s not get too carried away with ourselves with this. I have no bashed on Suh. If read this blog regularly, you know I have defended him. But this media tour in my opinion is just too much given his lack of production on the field in 2011. I agree. If Suh doesn't play better next season, he won't be on anybody's media tour. There is a lot of good things about Suh, but they have been negated lately by the thing you mentioned. I keep thinking lately "He is better than this." Hopefully he does learn from the experience, not just say he has learned from the experience. You're wrong in this case, I think, because Suh has caused his own problems. Suh did set a high standard as a rookie, no doubt. But he got a lot of reward for it - far behind other DTs. With rank comes reponsibility. He didn't live up to it in '11 yet was still somehow in demand for all this "media tour." Something didn't seem right about it.